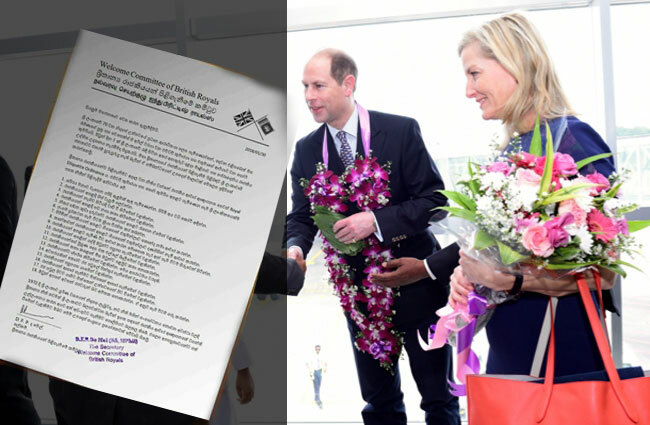 The Sri Lankan Government and the British High Commission in Colombo today rubbished the false reports doing the rounds on social media and certain websites regarding alleged guidance issued by the so-called ‘Welcome Committee of British Royals’. There have been reports and Facebook posts, citing a certain document, claiming that a committee by the aforementioned named has issued 18 guidelines to be followed in the presence of British Royals. The reports come in the wake of the visit of Prince Edward, the Earl of Wessex, and the Countess of Wessex to Sri Lanka to participate in the island nation’s 70th Independence celebrations on Sunday (Feb. 4). However, Sri Lanka’s Ministry of Foreign Affairs and the British High Commission Colombo issued a join media release today refuting the reports. “No such committee has been constituted by either the Ministry of Foreign Affairs or British High Commission,” the statement said.